Share the post "A Tendency to be Torpid"
We are certain of one thing living on the flatlands of North Iowa, and that is having the wind nearly ever-present as well as the rapid change in temperatures due to the speed and direction the wind is coming from. Instead being out of doors as I’d planned for today, I spent instead several hours performing domestic chores inside my office before having to be at my public open house this afternoon. As it was growing all the more chilly outside when I arrived at the open house, I was almost certain I wouldn’t have any visitors. To my surprise, there were people coming and going most of the time. Having an opportunity to inspect it more closely, I was all the more amazed at how well built it is. The home is as straight as an arrow, the floor plan is great, and the poured concrete walls in the basement show no signs of cracking. Whomever built it back in 1941 really knew what they were doing. Yes, there are cosmetic improvements one would likely want to make, but when you have something rock solid to work with, the job goes all the more easily. I really like the oak stair rail leading to the second floor. It gives the home a more modern feel. Everyone who went out to the garage came back in amazement of its size. I told them the current owner was able to park three cars if need be inside. I’m confident it’ll sell once the weather warms up. One of my dear clients stopped by this afternoon on his way from working on a home he’ll be listing a few months from now. He gave me his progress report and I was delighted to hear how well thinks have been moving along for him. He is one of the best finish carpenters I personally know. He is so good, he doesn’t have to do any advertising. It’s been strictly word of mouth with him for years. Now that’s saying something. It sort of makes one re-think the reasons some businesses do so much advertising. Could it be excessive greed or are they really not that good to where they have to create an illusion of being such in their advertising campaigns. As most of my people have realized, I do a minimal amount of advertising and it works just fine for me. Not that I’m so exceptionally bad looking because I think I take care of myself, but to have a glamour photo taken and splashed all across the media spectrum is a bit much. Over the years some of my clients and customers asked why I don’t splash my face everywhere like my competitors do. I said, “I would rather spend my time and money on marketing my listings rather than shelling out the bucks to keep my face smeared everywhere. Looks can only get a person so far until more sooner than later the intelligence factor is called into play. It still amazes me though how easily the public can be duped into believing what comes out of the mouths of flashy salespeople. Someone just told me today how he’ll never again get himself sucked into buying another home at the top of his price range. All I could say was, “Good for you!” To make a mistake is more easily forgiven as long as it’s not repeated. Several days ago I went to check on a project which was under way by a worker one of my clients hired to do some minor repairs on her property. The worker knew I was a bit disappointed in the amount of time it was taking to where he said, “I get the feeling you think I’m lazy.” Since I really don’t like calling people lazy I said, “No, I’m rather beginning to believe you have a tendency to be torpid.” He smiled and said, “Oh, Ok that makes me feel better as long as you’re not calling me lazy.” I smiled, gave him a little more encouragement to get it finished and moved on. Yes, as I see it, more and more of the general public are becoming torpid and they don’t even realize it. 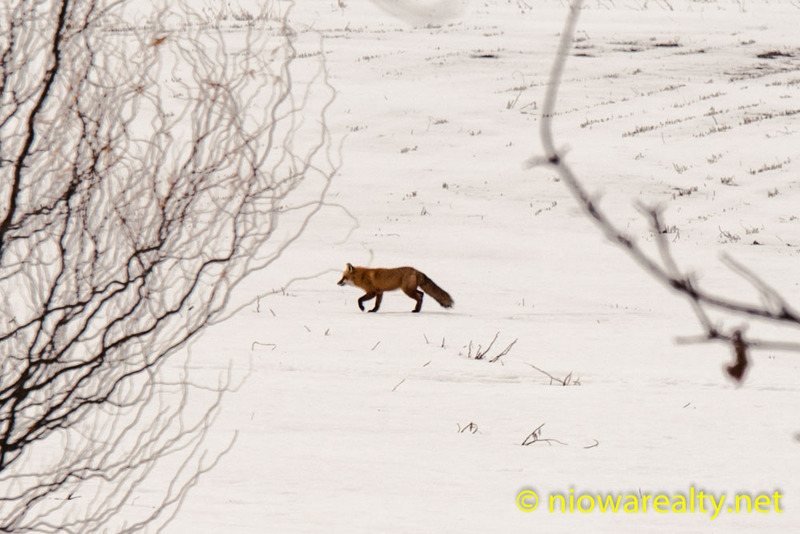 How do you all like the photo I snapped of a fox in a field? Alas the coyote population must be getting under control since they have a tendency to kill fox cubs. Now let’s get very busy and start culling this City and surrounding areas of the deer whose populations are exponentially exploding.